PetCure Oncology’s 1,000th patient is the epitome of hope. 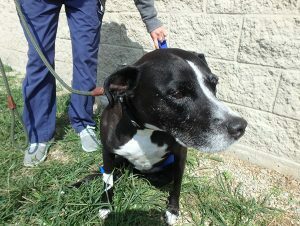 At only three months old, a Pit Bull Boxer mix named Sydney showed up on the doorstep of Roy Teng’s home in Richmond, Indiana, in October 2009. “My wife, Jackie, opened the front door and Sydney was there looking up with her puppy eyes,” said Roy. Sydney has been with the Teng family ever since. At the time, Roy’s son Zachary was four years old and the family was nervous about having a new dog around such a young child. But Sydney turned out to be Zachary’s guardian, following him, protecting him, and even sleeping at the foot of the stairs after he went to bed. 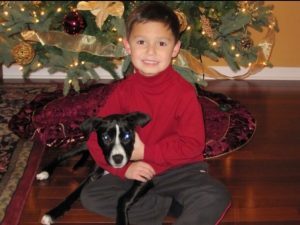 “She has been a wonderful dog, extremely athletic, energetic, and loves my son,” said Roy. Over the past eight years the Teng family has added two more furry family members: a sweet and loveable Pit Bull mix named Bella, and Zane, an energetic but nervous Jack Russell terrier. Sydney as a puppy, guarding her big brother Zachary. Around November 2016, the family noticed Sydney had a limp in her left hind leg. They thought she had probably slipped on some ice in their backyard. In December 2016, Roy took Sydney to their primary care veterinarian as Sydney was still limping. X-rays found volatile ACL degeneration and tears. Their doctor referred Sydney to a veterinary orthopedic surgeon who performed surgery to repair the ACL tears. The extensive surgery and six weeks’ rehabilitation did not significantly resolve Sydney’s symptoms. More rehabilitation was recommended and after two months the family started to see some improvements. However, in August 2017, Sydney’s right hind leg started to give out. Roy took her back to the orthopedic surgeon, who believed the issue was with her spine and ordered a CT scan. The scan found a spinal tumor that had caused significant compression of the spinal cord. The surgeon notified the family that there was nothing he could do and suggested that they consider putting her down in the near future. 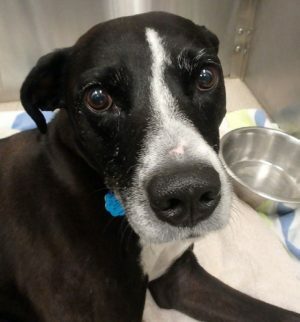 Hoping for a second opinion and another option, Roy went back to their primary care veterinarian and, unfortunately, received the same diagnosis. The doctor also recommended euthanasia and offered to perform the procedure at the family’s home. “At this moment, we thought, ‘This is it. We are at the end of the road,” said Roy. He and his wife decided to follow their veterinarian’s advice but were completely devastated. Roy is a radiologist in human health care and told a fellow radiologist and dog owner about what his family was going through. Roy’s colleague shared that his dog had spinal surgery at Care Center in Cincinnati, Ohio, and highly recommended the facility. “Truthfully, we were at a point where we would try anything,” said Roy. Roy immediately called Care Center and notified them he had a dog with a spinal tumor and paralyzed hind legs. The family knew this was their last option and were expecting to have Sydney receive spinal surgery. They were not expecting short-term radiation treatment. Roy took Sydney to Care Center for tests and to discuss options. Dr. Kelsey Pohlmann, a board-certified radiation oncologist at PetCure Oncology’s Cincinnati location inside Care Center, recommended stereotactic radiosurgery (SRS), an advanced form of radiation therapy. SRS is precisely aimed at the tumor with CT guidance and involves far fewer treatment sessions and anesthetic events (1-3) than to conventional radiation (15-30). Roy knew about the success of SRS in human medicine and was fascinated that in just a few short treatments, the radiation would target the tumor directly—no surgery, no rehab, and no long-term therapy. Sydney received three rounds of SRS on Sept 5-7, 2017, and she stayed overnight during her treatment at Care Center. By the end of her first day, Sydney had already contributed to an incredible achievement, becoming the 1,000th patient treated by PetCure Oncology since the organization launched in 2015. Roy was deeply moved by the level of care, compassion, and attention shown by the staff of PetCure Oncology at Care Center. After each treatment, Roy received phone calls from the team with updates on both the process and how Sydney was feeling. The radiation therapist, Kelly McSwain, R.T.(R)(T), texted Roy photos of Sydney every day. Just one day after treatment, Sydney was already back home and back to her old self, seemingly unaffected by it all. Roy has already noticed that Sydney has some function back in her hind legs, an early sign that her symptoms are alleviating. The Teng family understands that Sydney might not be able to run around like she used to, but stopping the progression of the cancer is what matters most. One of the many photos PetCure Oncology at Care Center staff sent to the Teng family during her therapy. After Sydney’s treatments and seeing how well she is doing in her recovery, Roy can’t recommend SRS enough. As a radiologist himself, he has seen the positive effects and benefits of SRS treatment and wants more pet owners to know that they have options in their pet’s fight against cancer. “It doesn’t have to be a death sentence,” he said. Roy would like to speak with his primary care veterinarian and other veterinarians to recommend SRS to any pet parent who is willing to learn more.